I’ve thought a lot about the ordinary citizens of Hitler’s Germany: what it was like to watch fascism appear and grow. And then what it was like to live immersed in it, like it or not, like lobsters in the pot (if you haven’t read All the Light We Cannot See you might want to). A lot of those German people couldn’t believe that the outrageous thing suddenly on their doorsteps was a monster. They couldn’t grasp the menace of the regime that was growing everywhere like a spore-spewing fungus in the minds and souls of their loved ones and friends. I’ve wondered what I would have done if I’d been there. Could I have realized the import of it? Would I have spoken up? Would I have shut up? Would I have left the country? Would I have succumbed to the pressures and the fear, pretended to myself that the monster was not a monster, and by default let myself be counted as Nazi? I can only hope not that. But I don’t know. Those German people of my parents’ and grandparents’ generations didn’t have any precedent to compare their situation to. Or rather, they had no example near enough in history, or similar enough, to make use of. Hitler took them by surprise, more or less. We do have a precedent. We have them. Hitler’s pomps and works happened, beginning to end, in my lifetime. That’s almost unimaginable if you think about it. Unimaginable, almost. And so, no, I don’t know what I would have done if I had been there then, but I know what I will do here and now. I will be one of those who speak up and shout out. Again and again and again and again, however long it takes or until I’m dead, whichever comes first. (I am 78 and I would like to see this one out, though, know that.) I will light my light and keep it lit, and jump up and down with it and yell and wave it around, and be one of the many many lights. Photo credit: Wikimedia Commons. 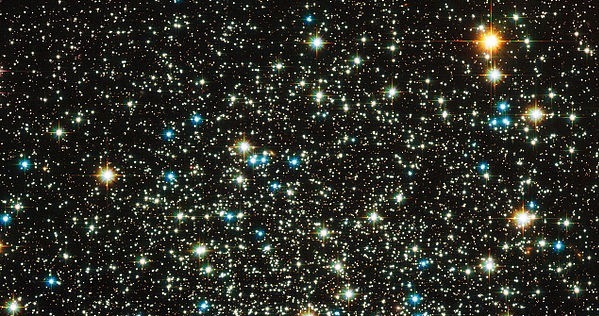 Picture created from Hubble Telescope images.